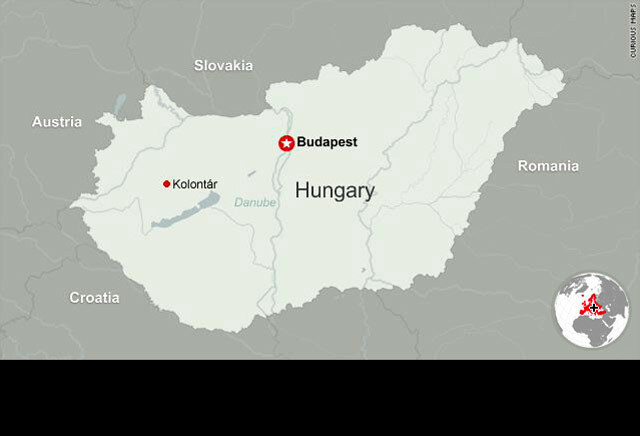 Devecser, Hungary (CNN) -- The Hungarian government Thursday made an urgent request to the European Union for help in the cleanup effort after a reservoir holding industrial waste burst earlier in the week. The government wants expert assistance in three villages left covered by the toxic red sludge after the accident Monday, the official news agency MTI reported. Meanwhile, the sludge from an aluminum plant reached the Danube, Europe's second largest river, on Thursday as emergency officials worked to contain as much of the leak as possible. "It is a huge tragedy for the whole country," said Anna Nagy, a Hungarian Disaster Management offical. "We love the Danube, we're very proud of the Danube and we tried to protect it." "I hope we can save the life in the river," she said. Hungary needs time to calculate the cost of the disaster, saying that the government's first response had been to try to save lives and clean homes. Tibor Dobson, a top disaster management official, told CNN that the sludge -- which flowed from an aluminum plant reservoir that burst on Monday -- is less dangerous than it was when it spilled. Officials believe pH levels have dropped to within an acceptable range, making the river safe, Dobson said. They are monitoring the Danube for sign of toxicity, such as dying fish. Nagy said pH levels had fallen to 9.1. That's more alkaline than neutral, which is 7 on the scale, but much less than it was originally, at 13, the Catastrophic Protection Unit said Thursday. Emergency workers were pouring plaster and fertilizers in hopes it would bind with the sludge and counter its alkalinity. The exact chemical composition of the sludge has not been revealed, but aluminum processing normally involves compounds that include cyanide, cadmium and chromium. The environmental disaster -- which occurred nearly 100 miles west of Budapest near the town of Ajka -- has killed two children, ages 1 and 3, an elderly woman and a 35-year-old man whose SUV overturned in the sludge. About 250 people have been evacuated from their homes, said Gyorgi Tottos, a spokeswoman for Hungary's Catastrophe Protection Unit. The reservoir has since been repaired and the flow from the pool halted. But the material that flowed out of the reservoir continues to pose a threat. The plant received an operating permit in 2006, he said. The European Commission is studying a copy of the permit and sees nothing wrong with the paperwork so far, he added. The aluminum factory has said it will pay for the victims' funerals. It has property and liability insurance, insurer Allianz Hungaria Biztosito told CNN, but would not say how much. Residents were advised not to eat produce from gardens that were covered when the dam burst. It was not clear when residents evacuated from affected areas in the villages of Kolontar, Devecser and Somlovasarhely would be able to return home. The long-term consequences of the leak were also unclear. In some villages, police with guns patrolled some of the villages to keep looters at bay. A state of emergency has been declared in three counties, the State Secretariat of Governmental Communications said. CNN's Nic Robertson, Tommy Evans, Jim Boulden and Eileen Hsieh contributed to this report.